Gwion Edwards is the popular choice to be Posh player of the season for 2017-18. The average Peterborough United fan on Twitter has predicted their favourite club will just miss out on the play-offs. Junior Morias is tipped by Posh fans to have a great season. a) Where do you think Posh will finish? b) Who will win League One? c) Who will finish bottom of League One? d) Who will be Posh player-of-the-year? Here are a selection of your responses. a) 7th b) Blackburn c) MK Franchise d) Who knows? Of the 54 people who replied (in 30 minutes!) the most (8) went for a sixth-place Posh finish. All Posh finishing positions between 2nd and 17th were predicted apart from 14th! Unusually no-one predicted that Posh would be champions. The average predicted Posh finishing position was between 7th-8th (nearer to 8th). Blackburn picked up 36 votes to finish the season as League One champions. Two-thirds of the votes cast! Other teams predicted to become League One champions were Portsmouth (7), Wigan (4), Bradford City (3), MK Dons (1), Plymouth (1), Charlton (1) and Scunthorpe (1). nShrewsbury were the most popular pick to finish bottom with 13 votes. 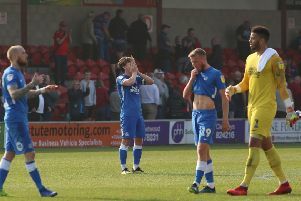 Others teams predicted to finish bottom were Oldham (11), Blackpool (9), MK Dons (7), Cobblers (5), Gillingham (4), Wimbledon (2), Walsall (1), Doncaster (1). Gwion Edwards was the most popular nomination to finish the season as Posh player-of-the-year with 14. Other Posh players to receive nominations as potential players of the year were: Michael Doughty (8 nominations), Junior Morias (7), Ricky Miller (6), Ryan Tafazolli (5), Jack Marriott (4), Marcus Maddison (2), Danny Lloyd (2), Jermaine Anderson (1), Jack Baldwin (1) and Chris Forrester (1).